Summary:While not as popular as the larger hosting companies, they offer very competitive pricing and hosting plans to suit your needs. With their state of the art interface panel and unparalleled 24/7 technical support their customers tend to stay with them. They offer free domains, free setup,excellent walkthroughs and a money back guarantee. 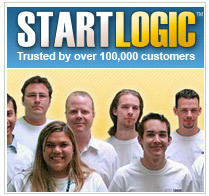 StartLogic offers more to their customers for less of their hard earned dollars – Their basic package comes with 50,000 megs of space, 750 GIG of monthly transfer, unlimited emails (POP and web-based), CGI, PHP, mySQL, FrontPage, eCommerce, Power Plugins, a site builder and a ton of other features.